Miami, Hialeah, Fort Lauderdale, Pembroke Pines and Hollywood. as other drainage areas and low lying spots. LargoFL wrote: looks like a dry week ahead for my area..Billsfan's area has best chances for rain a 40-50% chance today down there..good luck Billsfan!!! Thanks Largo! I know I'll regret saying this, but I don't need any rain right now, at least on work days and during work hours. We are already WAY behind schedule due to Irma and this is really making a mess out of things. hi Billsfan, yes I was thinking of you and the rains affecting work,i see the flood warning was only till 9 45am I think it was..hopefully it wont be so bad thru the day..good luck ok.
Billsfan, this weekend but listen to YOUR local weather guy ok..12Z GFS..
Hey St Pete...did you lose power because of this..this morning?...........................A paraglider got caught in power lines Tuesday morning in St. Petersburg and had to be hospitalized. The incident happened about 9 a.m. at 60th Street and 1st Avenue North. Police said the paraglider was being treated at Tampa General Hospital for severe burns. A witness said she heard three "bangs" and said it sounded like a transformer going off. About 100 people lost power in the area, and Duke Energy was notified. Residents said power was restored before noon. Police said there were other paragliders in the area but they had left the scene. well enough from me lol..a dry week ahead for my area it seems. well, I found out for five days two weeks ago and I don't know how they did it. But I guess if you never know any different you adapt. LargoFL wrote: Billsfan, this weekend but listen to YOUR local weather guy ok..12Z GFS..
um, NO THANK YOU... I already gave at the office. Even if it stops early, it's still pretty much a wash out. Unfortunately. Where does that storm come from that they have hitting us? BillsfaninSoFla wrote: Where does that storm come from that they have hitting us? cntl Fl where afternoon temps will be near normal. I had to Google it. It's a bit NE of JR and ESE of san. Looks like it's in south central Pasco near the Hillsborough/Pasco county line. The local nor'easters up here vary greatly with respect to rain. Could range from a stray shower or two to a full on deluge. The constant is the wind, rip currents, elevated tides, beach erosion, possible coastal/river flooding. Seems like this may potentially be a good set up for rain - frontal boundary just south of the area, high pressure to the north, low pressure further south. We shall see how the forecast fine tunes itself into Friday. A prime nor'easter event set up here in May 2013 and dumped over 15" of rain over a 3 day period. Southeast Georgia and the Adjacent Coastal Waters. Small craft advisory for the offshore coastal waters. Minor to moderate river and coastal flooding continues. in Jacksonville website on the internet at weather.gov/jax. Good Early Wednesday Morning folks..the A/C repair guy told me he didn't have power for a week after Irma..and he said some on the next block from him, are still without power and might get it restored by the weekend wow...well I hope John and WD made it thru IRMA ok and have their power restored also..........Blogs Coffee is perking for when you get here..enjoy..have a great day everyone! EURO model still hinting at something coming up from the Caribbean next week..
Good morning Largo and all.. Thanks for the updates Largo. NHC broke out the crayons. 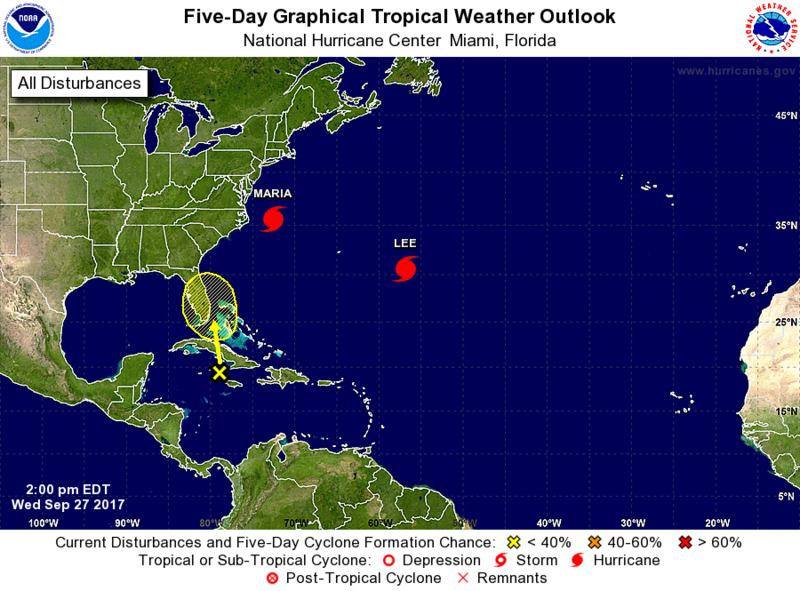 Hurricane Lee, located over the central Atlantic Ocean. before upper-level winds become less favorable early next week. Keys, and the Bahamas during the next several days. thunderstorms near Fort Drum, moving east northeast at 10 mph. Local met just said on TV the tropics is getting quite active especially next few weeks..
whatever the EURO see's in the Caribbean and comes into the gulf might be a big one in area,but lets wait for the 1st week of OCT to get here, then we'll see what happens..
well the models have been saying for awhile now that OCT will be a wet one for Florida. Hi all. We've been so dry that the sprinklers are going again tonight. If we get a little rain it's ok with me. Seems like it's feast or famine. evening...especially to the south of the I-4 corridor. available shelters if you are displaced due to flooding. Florida`s rivers due to the recent dry weather. Good Thursday Morning Folks! !...well rain chances up to 20% around my area today we'll see how it goes thru the evening..folks in south and east coast Florida heed your Local forecasts thru the weekend ok..hopefully just rain....well Blogs COFFEE is perking for when you get here enjoy,have a great day everyone! 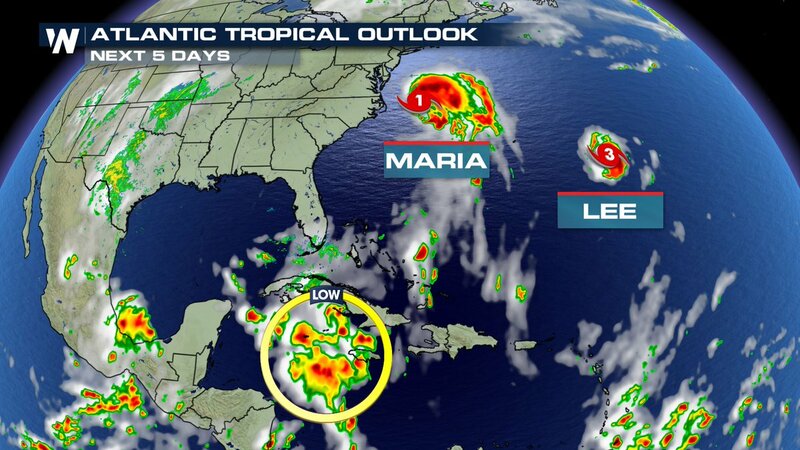 Aug..whatever comes up from the Caribbean next couple of days seems to ride up the east coast, then later gets pushed back to the gulf thru north florida looks like...still 3-4-5 days for this to change and they still don't know if it develops ok..just stay a lil more alert thru Monday ok. I'm hoping my area gets some of this rain,and just like PT I'm putting My sprinklers on tomorrow..this 90 degree temp along with no rain is again drying things out here. LargoFL wrote: I'm hoping my area gets some of this rain,and just like PT I'm putting My sprinklers on tomorrow..this 90 degree temp along with no rain is again drying things out here. I had some rain last night. Got .10 in the bucket. Not to bad when we were not to get rain. i'll take it. Largo my power came back on 5 days after Irma. Looks like we might get some good rain chances sat. and sun. All's good up my way. Largo you might of blew a fan motor if your a/c was turned on when the power came back on. Its called a power surge. I had gone around and turned and unplugged everything before the power came back on for that very reason. good morning John,yeah that's what blew the fan motor,and yes I guess it was still turned on..i have to remember that for any future storms..thanks....glad you got a lil rain...my area is starting to feel desert like lol..hope this weekend we do get some..have a great day too ok.